Earlier this year, we were very fortunate to receive an interesting donation which recalled the work of Miss Mary Thomas, the former Head of the House Craft Department at St. Gregory’s Roman Catholic Comprehensive School for Girls in Kirkby. Born in 1925, she was a dedicated teacher and later, founder in 1987 of the older peoples’ charity, Dark Horse Venture. She spent many years at St. Gregory’s and this collection recalls her work there. After gaining her teaching qualification, Miss Thomas began her career at the Bovington Secondary Modern School in Dorset, followed by a spell in Tunbridge Wells and then a stint at a rural school in Sussex. St. Gregory’s Girls’ School opened in September 1958 on the same site as St. Laurence’s School, which had previously opened as a mixed establishment for boys and girls in the newly developed town of Kirkby in 1956. The two came together in 1963, when Miss Thomas was offered and accepted the post of Head of the Housecraft Department at St. Gregory’s, where she was responsible for 12 housecraft rooms, 6 needlework rooms and a team of 14 teaching staff. She introduced ‘Mothercraft’ as a taught subject, educating the pupils in all aspects of parenthood, from conception within marriage to all aspects of caring for a child – often using the girls’ baby brothers and sisters to demonstrate the practical skills required. 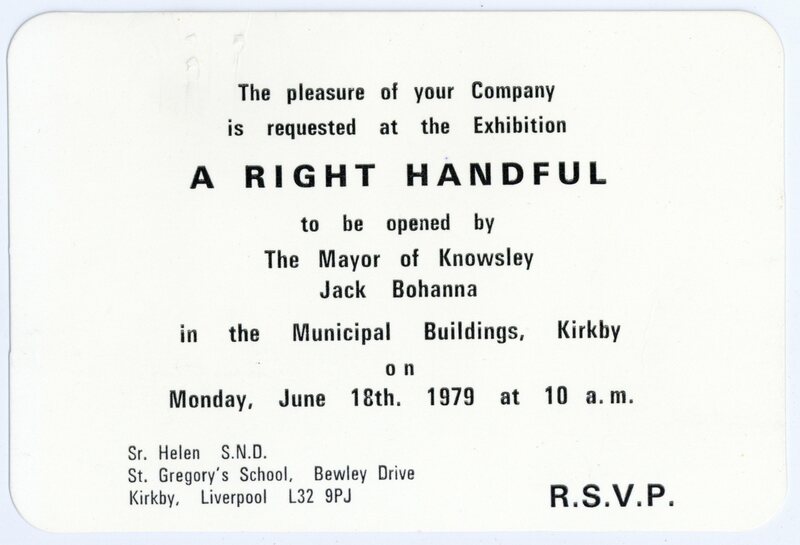 An exhibition – ‘A Right Handful’ – organised by Miss Thomas at the Kirkby Civic Buildings (now the Kirkby Centre, home of The ARK) celebrated the International Year of the Child, 1979 and highlighted the students’ achievements. Miss Thomas also made sure that the pupils were involved in their own community. She organised the Fourth Year girls in volunteering with the W.R.V.S. Meals on Wheels Service in Kirkby, helping to deliver hot meals to older people and also fundraising for the cause: it was reported that the students raised £33.00 and purchased a large aluminium food container and dishes which were presented to the W.R.V.S. by Miss Thomas and a group of pupils. 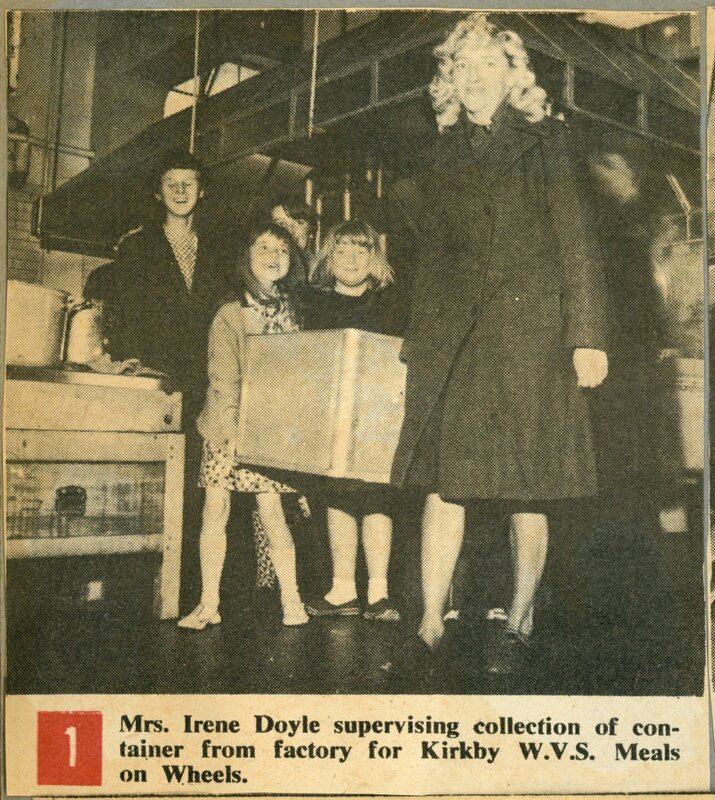 The collection of materials looks at her time teaching at the school, including a scrapbook, colour and black and white photographs and negatives, newspaper cuttings and examples of posters for a child care exhibition involving pupils from St. Gregory’s as part of the Year of the Chil d in 1979. Miss Thomas has also deposited a copy of her autobiography, ‘So there you are…’ published through the Small Wonders Community Programme. Thanks are due to Mike Ravey, who deposited the collection on behalf of Miss Thomas. We are currently holding an an exhibition of items from the collection which can be viewed at Kirkby Library during normal opening hours – and with Mike’s assistance, we’ll be hosting an open afternoon for ex-pupils which will be attended by Miss Thomas herself. This will take place on Thursday 9th June 2016 – do get in touch if you’d like more information. This entry was posted in 20th Century Archives, Exhibitions and tagged Education, Heritage Lottery Fund, Kirkby, Schools, St. Gregory's by Lin Rice. Bookmark the permalink. I would so love to be there, I have so many happy memories with miss Thomas and st Gregory school. I live in Ireland so unfortunately cannot make it good look and enjoy going fown memory lane. 1971 -1974.